Private investor and art collector Jeffrey Horvitz began acquiring 18th-century French drawings, paintings and sculptures in the 1980s. After three decades of careful purchases, The Horvitz Collection is recognized as the most important private collection of French drawings outside of Europe. Over the past two years, Horvitz donated four artworks to KBFUS. They can now be admired at the Petit Palais in Paris. Jeffrey Horvitz’s love for all things French began in 1964 during a seminal trip to France with his grandmother and a cousin. It was only about 20 years after World War II and Europe was still rebuilding. Horvitz recalls that the exteriors of many buildings in Paris were black, degraded from the ravages of time and war. Horvitz travelled to New York, London and Paris in his quest to obtain quality pieces, selling to dealers all over the United States. In 1980, he moved from Los Angeles to Florida to participate more closely in his family’s real estate business. He tried keeping up with his art dealer activities on the side, but no longer found it satisfying. Around 1983, he decided to start a collection of his own. In the late 1980s, Horvitz says, several factors determined his course to concentrate solely on French drawings. One of those factors was the Getty Museum in Los Angeles, which had a very large acquisitions budget at the time. The curator was building up its Italian drawing collection, and because of that interest, prices were driven up dramatically. Clark recently retired from his position as Research Curator at the Harvard Art Museums and is now the Curator of the Horvitz Collection, which includes approximately 1600 drawings, 180 paintings and 36 sculptures, all French. In the mid-1990s, at the urging of his wife, Carol, the Horvitzes also started to collect Chinese cinnabar lacquer and later, after deaccessioning the collection of Italian old master drawings in 2008, they began forming a third major collection of Japanese contemporary ceramics. Both Asian collections are managed by Carol, with the same passion and discipline as the French collection. A few years ago, Clark and Christophe Leribault, Director of the Petit Palais in Paris, began discussions to collaborate on a major exhibition of the French collection. Initially built for the 1900 Exposition Universelle, the Petit Palais became the Museum of Fine Arts of the City of Paris. 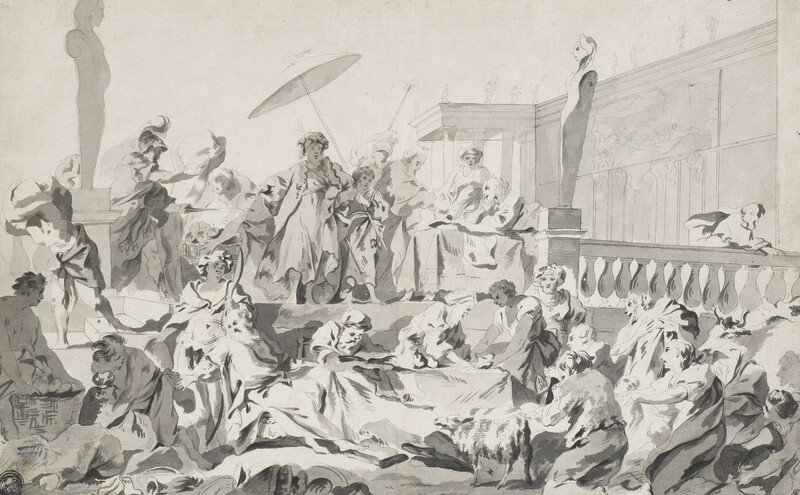 Titled ‘From Watteau to David – The Horvitz Collection’, the exhibition opened in March 2017, showcasing about 200 drawings, paintings and sculptures. It was accompanied by a 700-page catalogue: Tradition and Transitions: Eighteenth-Century French Art from The Horvitz Collection. Following the Paris exhibition, Horvitz generously donated three drawings and a painting to KBFUS, all carefully chosen, with the recommendation that the works first be loaned to the Petit Palais, and later be given to the museum. “My wife and I believe that unseen art is not art. “One of the things that interest us is providing art to the newer and smaller museums because huge, encyclopedic museums can only display a fraction of what they have. But for some of the smaller museums in smaller centers, having a new piece can make a bigger difference,” says Horvitz.